As a requirement VirtualBox and Vagrant need to be installed. The master_blueprint.json contains possible Ambari blueprint components and configurations. Apache Argus, the Apache open source project, with it’s comprehensive security offering for today’s Hadoop installations is likely to become an important cornerstone of modern enterprise BigData architectures. It’s by today already quite sophisticate compared to other product offerings. 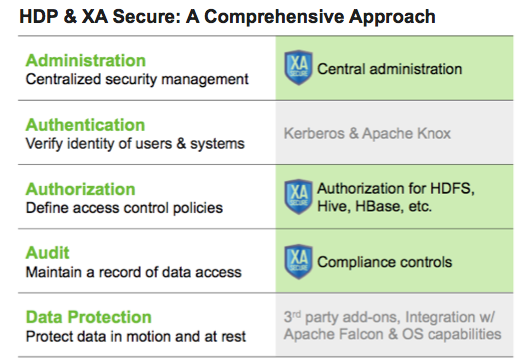 Key aspects of Argus are the Administration, Authorization, and Audit Logging covering most security demands. In the future we might even see Data Protection (encryption) as well. Argus consists of four major components that tied together build a secure layer around your Hadoop installation. Within Argus it is the Administration Portal, a web application, that is capable of managing and accessing the Audit Server and Policy Manager, also two important components of Apache Argus. At the client side or a the Hadoop services like the HiveServer2 or the NameNode Argus installs specific agents that encapsulate requests based on the policies specified. A key aspect of Argus is, that the clients don’t have to request the Policy Server on every single client call, but are updated in a certain interval. This improves the scalability and also ensures that clients continue working even when the Policy Server is down. Let’s go ahead an install a most recent version of Apache Argus using the HDP Sandbox 2.1. By installing the Policy Manager, Hive, and HDFS Agent you should have a pretty good idea of how Argus operates and a pretty solid environment to test specific use cases.